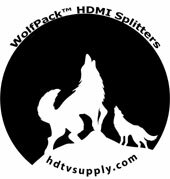 HDTV Supply's WolfPack HDMI to CAT5 Distribution system can display a single source on up to 100s of displays using a Single CAT5e/6 cable for each display. Our HDMI to CAT5 Distribution system family allows connecting any HDMI digital video source such as a PC, DVD player, Camera, AppleTV, Satellite, Cable Box, PC, Xbox, PS4 and more with an HDMI output to up to 100 of digital displays upwards of 300 feet away. 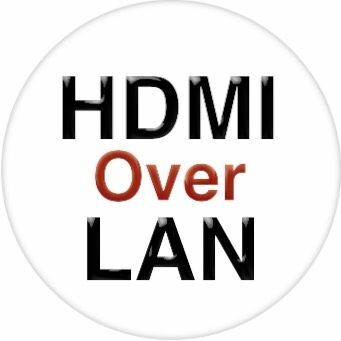 The HDMI to CAT5 Distribution splits an HDMI signal into any number mirrored (the same) outputs without signal loss upwards of 300 feet. Our Wolfpack Network HDMI Matrix Switch can be configured using 1 - Transmitter and dozens of Receivers (TVs) using the appropriate size Ethernet Switch. It uses CAT 5e/6 cables and a Gigabit Ethernet LAN switch with MJPEG techniques and an industry standard IP protocol to deliver 1080p video from sources that are 300 feet away from the Ethernet switch and another 300 feet away to the TVs. It also allows the system to grow in the field as its design allows you the flexibility of adding more displays to the system based upon the number of unused Ethernet ports available. Q: I have 5-TVs and 1-PC...1-TV 6 feet away, 1-TV 75 feet away, 2-TVs 150 feet away and 1-TV 225 feet away needing all the widescreens showing the same picture and having the same audio, what do I buy? A: You will need to buy one 8-port Ethernet switch and 5-receivers plus 6-HDMI cables (see all above). A single HDMI to CAT5 transmitter comes with it. Supports HDMI 1.3, HDCP 1.1 and DVI1.1 compliancy. Supports IR re-transmitting for one TV only. Cable testing showed that with 1080p resolution the HDMI input source can be 15 feet away using 24 AWG cabling. When transmitting a signal in 1080p resolution the CAT6 operating distance is ~100 meters or ~330 feet. Why not configure your HDMI to CAT5 Distribution System today? Uses our gigabit IP switches for extension and distribution. Extends 1080p HDMI signals up to 120m over a single UTP Cat5e/6 cable. With IR Control function it allows you control back the source at the end of destination. Maximum 3 layers of Ethernet switches could be passed through. Why not buy this HDMI to CAT5 Distribution today? A: You will need one 16-port Ethernet switch and 12-receivers plus all cables (not supplied). The single HDMI to CAT5 transmitter comes with it. A: You will need one 8-port Ethernet switch and 5-receivers plus all cables (not supplied). The single HDMI to CAT5 transmitter comes with it. Q: I need to send a cable box, a DVD player, a AppleTV and a to 15-widescreens 150 feet away with all showing the same picture, what do I buy? A: You will need one 16-port Ethernet switch and 15-receivers plus all cables (not supplied) and our companion 4x1 HDMI switch with EDID. The single HDMI to CAT5 transmitter comes with it. HDTV Supply includes a 1 Year Limited Warranty on this HDMI to CAT5 Distribution Set. The warranty states that (a) its HDMI to CAT5 Distribution Set will perform substantially in accordance with the accompanying written materials for a period of 1 year from the date of receipt and (b) that the HDMI to CAT5 Distribution Set will be free from defects in materials & workmanship under normal use & service for a period of 1 year. In order to get a warranty replacement for a defective item, HDTV Supplys Support Team will verify the product is eligible for warranty. An RMA number will then be issued. Shipped replacements will be in like new conditions, tested and all components included. HDTV Supply also sells a 3 and 5 Year Extended Warranty for this HDMI to CAT5 Distribution Set. Please go to Extended Warranties or see the above Options to purchase it. Why not buy this HDMI to CAT5 Distribution Set today? The below is your installation procedure. The unit is plug and play so no users manual comes with this simple HDMI splitter set. PLEASE PRINT THIS OUT AS PREPARATION FOR THE INSTALL. Make sure all the devices are turned OFF or unplugged for the wall before you start. 1. Plug the supplied HDMI TRANSMITTER (TX) into an HDMI cable. 2. Plug the other end of the HDMI cable into your video and audio source like a DVD player, cable box, etc. 3. Plug the TRANSMITTERS RJ45 connector into a CAT5e/6 cable. 4. Plug the other end of the CAT5e/6 cable into any of the inputs on the supplied Ethernet switch. The above takes care of sending the HDMI signal to the Ethernet switch. The below now shows how to connect the multiple TVs to the Ethernet switch. 1. Connect the CAT5e/6 cables from the TVs to any of the connectors on the Ethernet switch. 2. 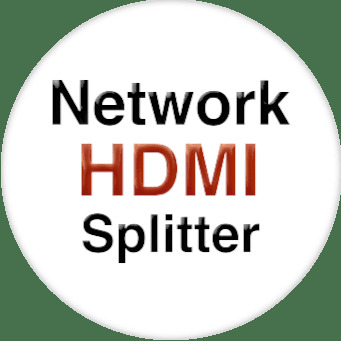 Connect the HDMI RECEIVERS (RX) to the TVs with a short HDMI cable. 3. Plug the CAT5e/6 cables into the RECEIVERS. 4. Plug all of your devices into the wall AC outlets and turn them ON. You should now see the source device on all of your widescreens. That is all there is to it. We suggest, if possible, that you use different colored CAT5e/6 cables so you will know what signal goes where.